Marcellus destroys a Carthaginian army at the river Himera. Both of the consuls were engaged in military operations in Italy, so Gaius Claudius Centho was appointed dictator by the consul Gracchus to lead the consular elections of this year. Quintus Fulvius Flaccus was appointed as his master of horse and was subsequently elected consul. Flaccus was obviously a veteran. He had been consul before in 237 BCE and 224 BCE, and he had also been censor. The previous year he had served as a praetor, which was not unusual for a former consul at this time in Roman history. Appius Claudius Pulcher did not travel all the way from Sicily back to Rome in vain, for he was duly elected as the second consul. It was his first consulship. Both consuls were charged with continuing the war against Hannibal in Italy. Publius Cornelius Scipio was elected curule aedile, in spite of his young age (he was just 23 or 24 years old). Elections were also held for the office of pontifex maximus. The new consul Quintus Fulvius Flaccus and the former consul Titus Manlius Torquatus were the favourites to win, but the tribes surprisingly voted for young Publius Licinius Crassus, who had so far never held a curule office. The Senate prolonged the imperium of many experienced commanders, among them the Scipios in Spain, Marcus Claudius Marcellus on Sicily and Marcus Valerius Laevinus, who was fighting the war against Philippos V of Macedonia. Two new legions were raised this year, bringing the total to 23. Some 92.000-115.000 Roman citizens and close to 7.000 equites were under arms now. About the same number of allies served in the Roman army. This was obviously a huge burden, both for the Latin and allied communities and for Rome herself. In fact, the consuls had a lot of trouble finding enough recruits for the newly raised legions and for strengthening the legions already in the field. Two Senate committees were set up to mobilise more young men in all of Italy. 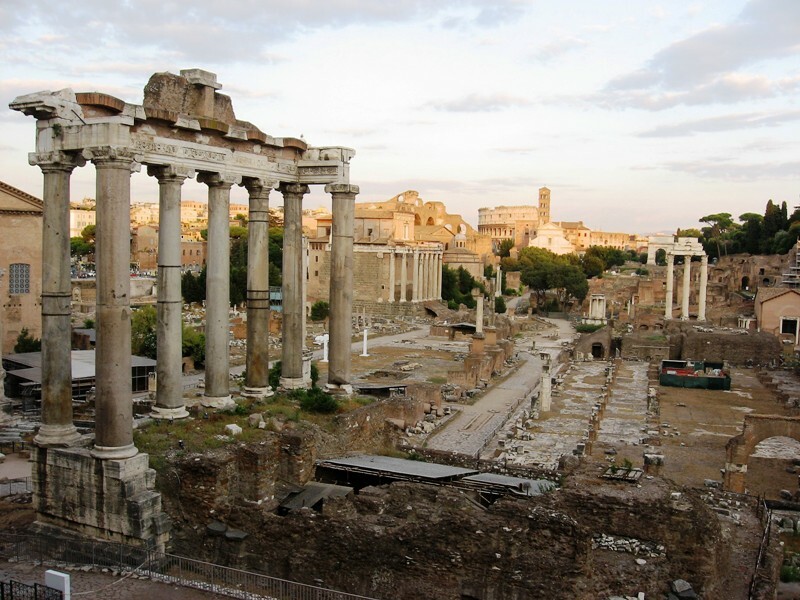 View of the Forum Romanum. There was a lot of trouble this year with citizens following foreign religious cults and neglecting the official state rites. Livius, who does not mention any of these foreign cults by name, blamed this trouble on peasants that had fled to Rome because of the war in Italy. The aediles were criticised by the Senate for not taking any action against these new cults. When they did try to intervene and ordered the crowds on the Forum to disperse, they were almost manhandled by the worshippers. The praetor urbanus, who outranked the aediles, now had to step in. Books containing prophecies or describing rituals and prayers had to be handed over to him, and foreign rites in public or consecrated places were prohibited. So much for religious tolerance, but there was a war going on and it was risky to anger the traditional gods by worshipping new ones. And there was more domestic trouble. Marcus Postumius from Pyrgi, a coastal city in Latium, was a publicanus, a member of one of the companies (societates) that had signed contracts to provide the armies in the field (especially those in Spain) with supplies. In 215 BCE, the State had agreed to bear the financial risk if their cargoes were lost at sea because of hostile actions or bad weather. Postumius turned out to be a most dishonest man and a swindler, who seriously abused this agreement. The publicanus and his associates had simply made up several shipwrecks and had put worthless cargoes on ramshackle old ships, letting them sink out at sea and then claiming a sum that far exceeded the value of the goods. When these tricks were discovered, there was a public outcry in Rome. The Senate was loath to intervene, but two people’s tribunes brought the case before the popular assembly and demanded that Postumius be ordered to pay a fine of 200.000 asses. The trial took place on the Capitoline and Postumius hoped that one of the other tribunes, who was apparently a kinsman, would use his veto. However, tribunes could no longer use their power of veto once the voting in the assembly had started and the urn had already been brought in to determine in which of the 35 tribus the Latins would vote; one of the privileges of Italians with Latin status was that they were eligible to vote in the assembly of the tribes (if they happened to be present in Rome, of course). Since the tribune was still unwilling to use his veto, the other publicani and their supporters began to cause public disturbances and ultimately the assembly had to be dissolved because of the threat of violence. The two people’s tribunes that had initiated the trial now decided to prosecute Postumius for a capital offence (res capitalis). The accused did not show up, and it is reasonable to assume that he went into voluntary exile. Others went into exile as well, thus ending the publicani affair. 212 BCE was a rather awful year for the Romans, especially as far as the war in Italy was concerned. This was mostly because of the loss of Tarentum (modern Taranto), one of the most important coastal cities in what was then called Calabria. Many Tarentines were furious about what had happened earlier this year to fellow citizens that had been held in Rome as hostages. These men had tried to escape, but they were arrested, brought back to Rome and then scourged on the Forum and thrown from the Tarpeian rock. Angered by these executions, a band of thirteen young noblemen from Tarentum led by Nikon and Philemenos began plotting against the Romans. They made a deal with Hannibal to betray the city to him. Hannibal took 10.000 picked men and marched to Tarentum in three days. During the night, Nikon, Philemenos and some of Hannibal’s best men killed the guards and opened two gates in the city walls so that Hannibal’s troops could enter. The Carthaginian general then ordered 2.000 Celts, led by Tarentine guides, to seal off the most important roads leading to the forum and to kill any Roman they might encounter. Map of Tarentum (copyright Google, Data SIO, NOAA, U.S. Navy, NGA, GEBCO). The Roman garrison was taken completely by surprise. The garrison commander, one Gaius (or Marcus) Livius, was intoxicated after having attended a drinking party at the Mouseion. He was awoken by the clamour outside and quickly fled to the docks where a little boat took him to the citadel (arx) at the harbour entrance. Many Roman soldiers were not so lucky. Philemenos and his men added to the confusion by blowing on confiscated Roman war trumpets. The Romans recognised the trumpets as their own and ran towards the citadel. Legionaries and allies running through the streets in small groups were an easy prey for the Celts and Carthaginians. In the end, some defenders managed to reach the citadel, where they were joined by pro-Roman Tarentines who now also feared for their lives. Hannibal then ordered the Tarentines to write the word ‘Tarentine’ on the doors of their houses. People who wrote that word on houses of Roman citizens (in order to protect them) would be executed. Houses without a mark on the door were now identified as Roman property and thoroughly looted. 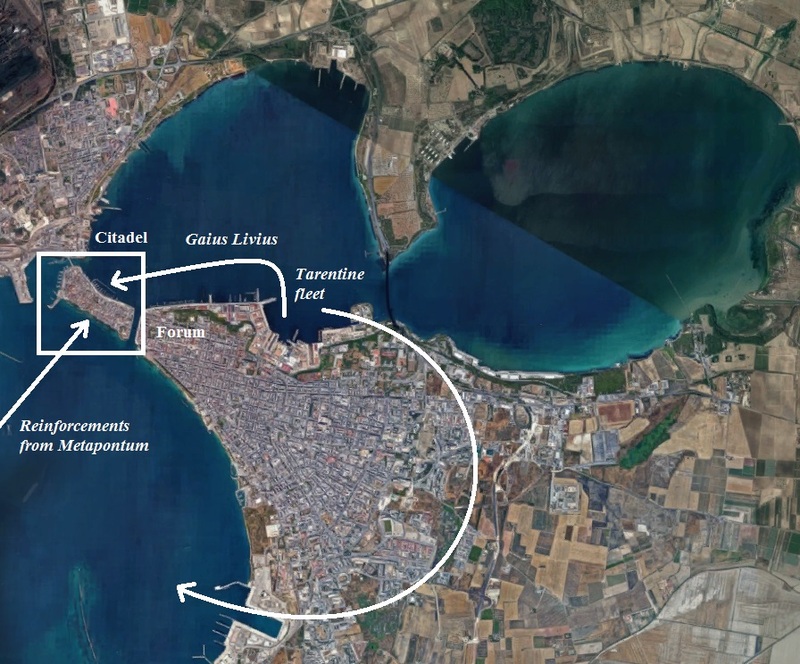 Hannibal had captured Tarentum, but the fact that the Romans still controlled the citadel was a blow, as this stronghold, located on a narrow peninsula, completely controlled the harbour entrance. The Tarentine fleet was anchored in the bays behind the citadel and supply ships were now unable to reach the harbour from the sea (i.e. the Gulf of Taranto). To add insult to injury, the troops from the citadel could threaten the city from their strong position and perhaps even attempt to retake it. Since Hannibal could not leave behind a large garrison, he decided to construct defensive works and a moat separating the citadel from the rest of the city. Heavy fighting broke out as the Roman defenders attacked the parties working on the rampart, but in the end they could not prevent its completion and suffered heavy casualties. Later, Hannibal tried to storm the citadel, but now the Romans were reinforced by sea. The entire garrison from Metapontum landed on the peninsula and joined the defenders. Together they attacked and destroyed the enemy siege engines, causing Hannibal to break off the assault. The Carthaginian commander knew that he needed to find a way to blockade the defenders in the citadel, prevent them from being supplied by sea and starve them into submission. For this he needed ships, but as stated above, the Tarentine fleet was on the wrong side of the peninsula. Hannibal now showed his brilliance again by ordering the Tarentines to drag their ships out of the water and load them onto carts. The carts were then pulled through the city down the wide road running along the city walls and leading from the harbour to the sea. In a few days, the whole fleet had been moved to open water and the Tarentines were able to block Roman ships sailing to the citadel with supplies. Things were beginning to look bleak for Livius and his men, but the Romans elsewhere in Italy did not leave them to their fate. A legate named Gaius Servilius managed to break through the naval blockade with a couple of ships loaded with supplies. The garrison, reinforced with the troops from Metapontum, would now be able to hold out a little longer. Meanwhile, the Romans were threatening Capua. The city was beginning to suffer from food shortages, as the Romans had destroyed most of the harvest in previous years. They now sent an urgent appeal to Hannibal to provide them with grain. Hannibal ordered Hanno to march from Bruttium to Campania to honour the Capuans’ request. When Hanno reached the city of Beneventum, where he had been defeated in 214 BCE, the citizens quickly sent envoys to the consuls, who were camping near Bovianum in Samnium. Quintus Fulvius Flaccus then force-marched his army to Beneventum, entering the city at night. When he heard that Hanno had gone off to gather grain for the Capuans, the consul decided to attack the enemy camp the next night. The elevated position of the camp made it difficult to storm and it was well-fortified, but Fulvius decided to attack it anyway. Roman casualties were heavy. According to Livius, the consul was about to give the order to break off the attack when the commander of a unit of Paeligni flung the standard of his unit over the palisade and into the camp, cursing himself and his men if they were unable to retrieve it. His example was followed by a senior centurion (princeps primus centurio) from the third legion, who took the standard of his century from the signifer and ordered his men to follow him. Fulvius now changed his mind and ordered his troops to attack with everything they had. Romans and allies soon broke into the camp from all sides, killing about half of the enemy soldiers and capturing the rest. The Campanians who had come for the grain and their carts and pack animals were also captured. Hanno had not been in camp when the Romans attacked, and this may have saved his life. 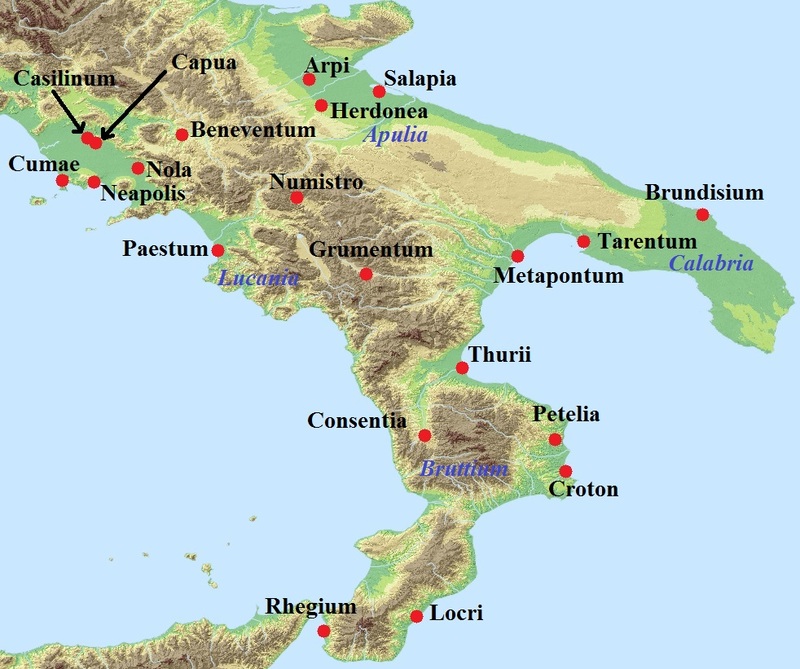 The removal of troops from Metapontum had saved the Roman defenders in Tarentum, but now that Metapontum itself no longer had a Roman garrison, it promptly defected to Hannibal. It was then joined by Thurii, a Panhellenic Greek colony founded in the 440s BCE. Among the hostages executed in Rome earlier this year had also been citizens from Thurii, and the city expressed its anger over their death by abandoning the Roman cause. The Roman garrison was lured out of the city, then badly cut up by troops led by Hanno and chased back to Thurii. The Thurians only admitted the garrison commander, one Marcus Atinius, and then quickly closed the gates, leaving rest of the garrison outside to be massacred. Atinius was respected for his mild and just administration of the city and was therefore allowed to leave Thurii by ship. After his victory near Beneventum, Fulvius Flaccus was joined by his colleague and together the consuls advanced on Capua to finally begin the siege of it. The proconsul Tiberius Sempronius Gracchus – the consul of 215 BCE and 213 BCE – was sent to Beneventum to guard it and to give warning if Hannibal marched out of Apulia to come to the aid of the Capuans. On his way to Beneventum, the proconsul was ambushed and killed. The circumstances of his death were mysterious, with Livius mentioning three different versions. Gracchus was either betrayed by a former Lucanian ally, surprised while he was taking a bath in the river or surrounded when he had strayed out of camp to avert bad portents. But whichever version is correct, Gracchus was dead and this was another terrible blow for Rome. An additional problem was that many of the volones now left their standards and went home. They believed the death of their commander discharged them from further service. The Romans disagreed and treated them as deserters, ordering a praetor to track them down and take them back to their units. The consuls’ first march on Capua was thwarted. Their army suffered a setback when it was suddenly and unexpectedly attacked by Capuan citizens and cavalry led by Mago (not Hannibal’s brother, but a subordinate commander of the same name). The Romans had many casualties and were confronted by Hannibal himself a few days later. In the ensuing battle, the Roman army was again hard-pressed when suddenly the army of Gracchus, now led by his quaestor, appeared on the horizon. Both sides disengaged and the encounter ended in a draw. But the consuls had learned a lot from previous defeats and knew that they could easily split up their army while Hannibal, who simply lacked the numbers, could not. Fulvius left for Cumae, while Claudius Pulcher invaded the territories of the Lucani. 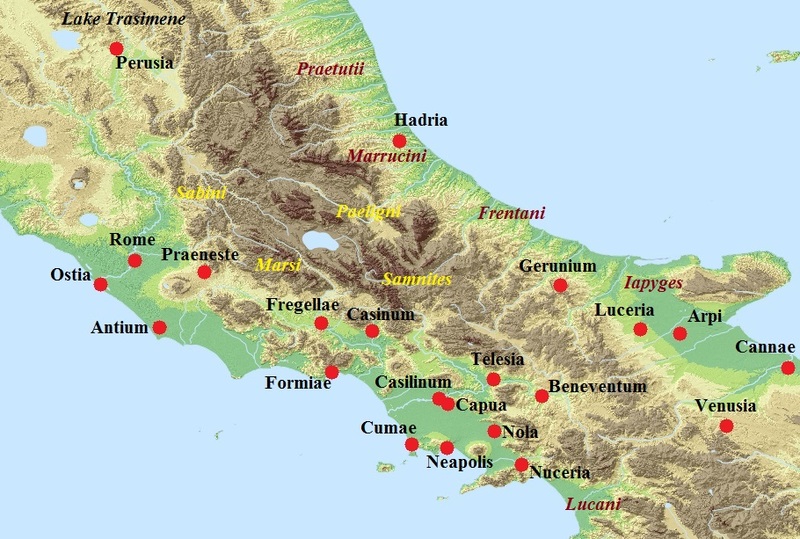 Map of Southern Italy (source: Ancient World Mapping Center. “À-la-carte”; CC BY 4.0). Hannibal decided to pursue the latter, who managed to evade him. He then bumped into a ragtag band of irregulars and volunteers led by a senior centurion (primus pilus) named Marcus Centenius Paenula. The outcome of the battle was very predictable: Paenula’s motley crew was cut to pieces and barely 1.000 men managed to escape. Hannibal now marched to Apulia again to confront the praetor Gnaeus Fulvius Flaccus and his army near Herdonea. Flaccus was the consul’s brother and his men were eager to fight. Hannibal reprised his tactics from the Battle of Trebia in 218 BCE and hid some 3.000 light troops in the fields and woods. At the same time, he sent some 2.000 horsemen under Mago to block the roads that the enemy might use to flee. According to Livius, the praetor was “quite as foolish and reckless as Centenius, though not to be compared with him in courage”. When the Roman line succumbed in the first charge, Flaccus galloped off the battlefield with his bodyguards, leaving some 20.000 men to be surrounded and slaughtered by Hannibal. The Battle of Herdonea was another ignominious defeat for Rome and it would certainly have consequences for the praetor. After so many disasters, there was still a glimmer of hope for the Romans. 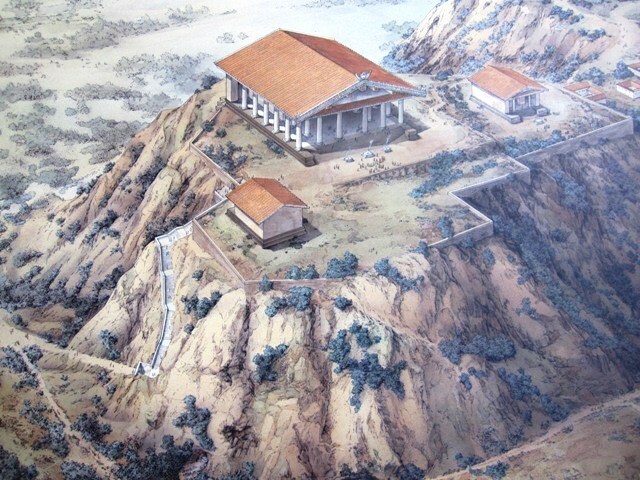 The consuls Quintus Fulvius Flaccus and Appius Claudius Pulcher returned to Capua and began to surround it with a wall and moat (circumvallatio). They also built defensive works and dug a moat facing outwards (contravallatio). The consuls were joined by the praetor Gaius Claudius Nero and soon Capua was surrounded on all sides by extensive lines of fortifications with towers, gates and three headquarters for the three commanders. The Romans also set up a professional system of logistics. Supplies had been gathered in large numbers in Casilinum and the Romans also controlled the river Volturnus, which they could use to transport grain bought in Etruria to the troops. The Capuans again sent messengers to Hannibal, imploring him to come to their aid. 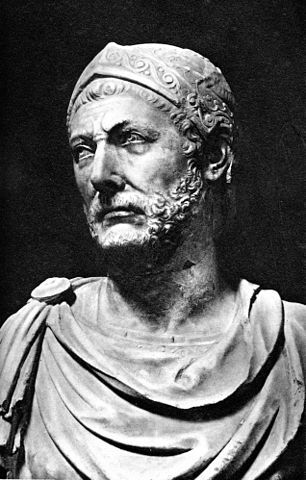 Hannibal – according to Livius – boasted that he had raised the siege of Capua before and would raise it again. But it was clear that the city was in big trouble. 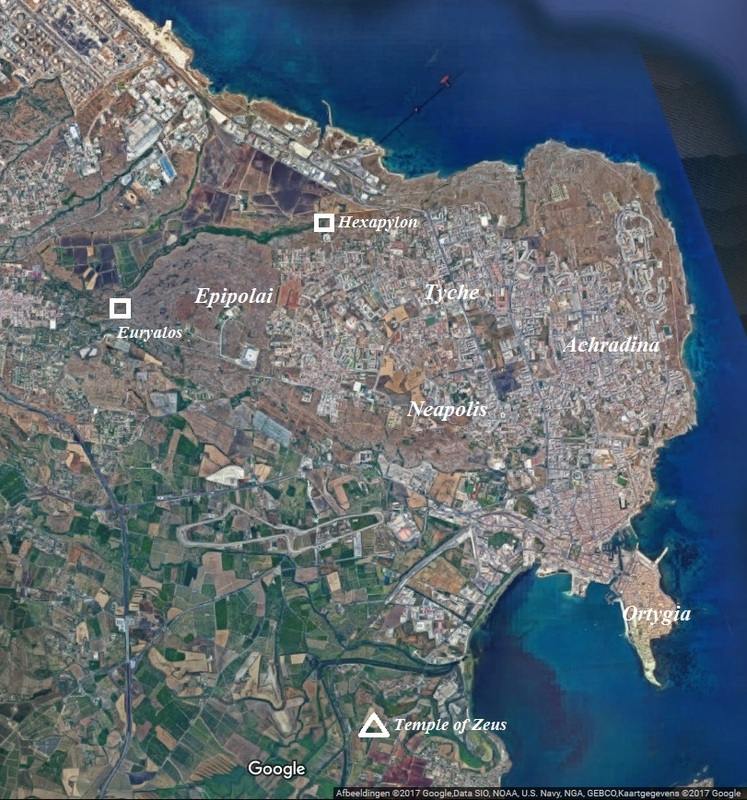 Fortune did smile upon the Romans just for once this year, as they managed to capture Syracuse on Sicily. The city had already been under siege for many months and a plot to betray it had been discovered and the conspirators executed. But then an opportunity presented itself. During negotiations about the ransoming of an important Spartan prisoner, a Roman soldier discovered a part of the wall that was significantly lower than he and his colleagues had previously calculated. The soldier counted the rows of stones, enabling his colleagues to work out the correct height for the scaling ladders. The Romans then learned that the Syracusans were celebrating the annual festival of Artemis (Diana in Latin). Citizens and soldiers alike would be drunk from the wine (a condition exacerbated by the lack of bread), and many would be asleep. Map of Syracuse (copyright: see bottom right corner). On the third night of the festival, Marcellus directed his storming parties in a surprise attack against the weak spot. The Romans quickly managed to take the walls and open the gates of the Hexapylon. Marcellus and his main force were then admitted and they soon controlled the entire plateau of Epipolai. They also occupied the fortress of Euryalos, with the defenders surrendering after brief negotiations. Neapolis and Tyche were pillaged, but no citizens were harmed. The Syracusans for the moment managed to cling on to the eastern Achradina district and the citadel on Ortygia, which both had their own set of fortifications, but they were in desperate need of help. Roman deserters fighting for the Syracusans were especially desperate, as they knew there would be no mercy for them. Himilco and Hippocrates were both in Agrigentum when the Romans struck, and they now hurried to the aid of the city. They were too late. After a Carthaginian attempt to relieve the besieged failed miserably in autumn, disease broke out in both camps. It seemed to affect the Carthaginians more than the Romans, and Himilco and Hippocrates died along with thousands of their men. Towards the end of the year, a Carthaginian relief fleet tried to reach Syracuse and bring provisions to the besieged. It was a large fleet, with some 130 warships and 700 transports. Marcellus intercepted the Carthaginians near Cape Pachynus – south of Syracuse – and after waiting for more favourable winds offered battle. The Carthaginian admiral Bomilcar declined, sending the transports back to Carthage and sailing on to Tarentum with his quinqueremes. The fate of the Syracusans had now been sealed. A Spanish commander named Moericus deserted to Marcellus and agreed to open a gate on Ortygia to admit the attackers to the citadel. A Roman party was landed near the gate over sea, and at first light Marcellus staged a diversionary attack on the walls of Achradina, forcing the Syracusans to commit most of their troops there. While the fighting raged, more troops were transported to Ortygia. The island was now only lightly defended, and the citadel was quickly captured. Achradina fell soon afterwards. The siege had lasted close to two years. 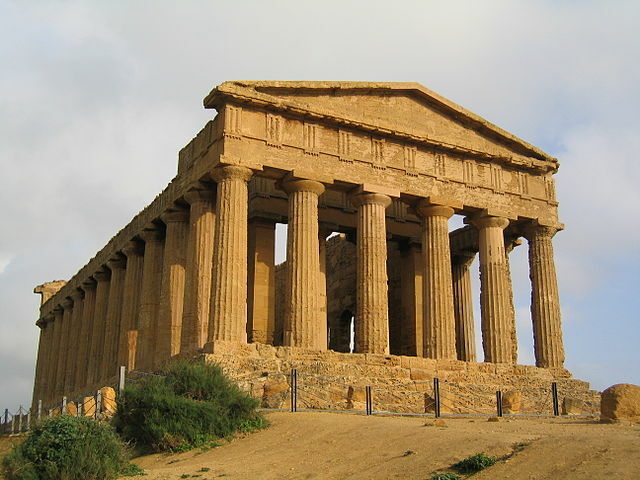 Temple of Concordia, Agrigentum (photo: Evan Erickson). All of Syracuse was now in Roman hands and soldiers began to loot the recently occupied parts of the city. Marcellus himself confiscated the royal treasures and had many Greek statues and other artworks transported back to Rome. This art theft caused the Greek historian Polybius, usually sympathetic to the Romans, to frown. Not because he condemned pillaging, but simply because he felt that the conquering Romans were now beginning to abandon their simple but honest way of life by growing used to the luxuries of the defeated. More shame was brought upon the Romans when it turned out that a Roman soldier had killed the mathematician Archimedes during the looting. The latter had been studying geometrical figures that he had drawn in the sand and the soldier had no idea who the man was that he had killed. In a different version of the story, the mathematician was so engrossed in an experiment that he refused to come with the soldier before he had finished it. The soldier flew into a rage and killed Archimedes. Marcellus made sure that the mathematician got a proper funeral and had a monument set up for him (it was rediscovered by Cicero some 150 years later, or so the story goes). Then there was more success for the Romans when it was reported that Titus Otacilius had pillaged the territories of Utica in Africa and had captured 130 cargo ships full of grain and much other booty. The war on Sicily, however, was far from over. Fighting continued around Agrigentum, which was still in Carthaginian hands. The Carthaginians were led by Hanno and Epicydes (who had fled from Syracuse), but their real military mastermind was a new commander named Muttines or Myttones. Muttines was a man of mixed blood, a Liby-Phoenician, and this led to tensions with Hanno, who was a full-blooded Carthaginian. Although he had won a few skirmishes against Marcellus’ forces with his cavalry, Muttines was eventually recalled to quell a rebellion among Numidian horsemen in Heraclea. Hanno then foolishly decided to attack Marcellus’ army. The Punic expeditionary force was annihilated at the river Himera, the Romans killing thousands of Carthaginian troops and capturing eight war elephants. This was the last battle fought by Marcellus on Sicily, but the war on the island would continue for two more years. Polybius, The Histories, Book 8.24.8.37. Richard Miles, Carthage must be destroyed, p. 292-294. Ancient Calabria was the region in the heel of Italy (modern Salento), but the term is now used for the region in the toe of Italy. Livius writes that these men were kept ‘in atrio Libertatis’, perhaps a reference to the lost temple of Jupiter Libertas on the Aventine Hill (see Livius 25.7). The term given by Livius 25.14. The correct term is princeps prior.